Fox Plumbing & Heating has hired the student run creative advertising agency, HuskyCreative of the University of Washington. They are helping to get the word out about changes in energy efficiency and what that means to hot water tanks in 2015. Read about how we're working with this great student organization in our press release. 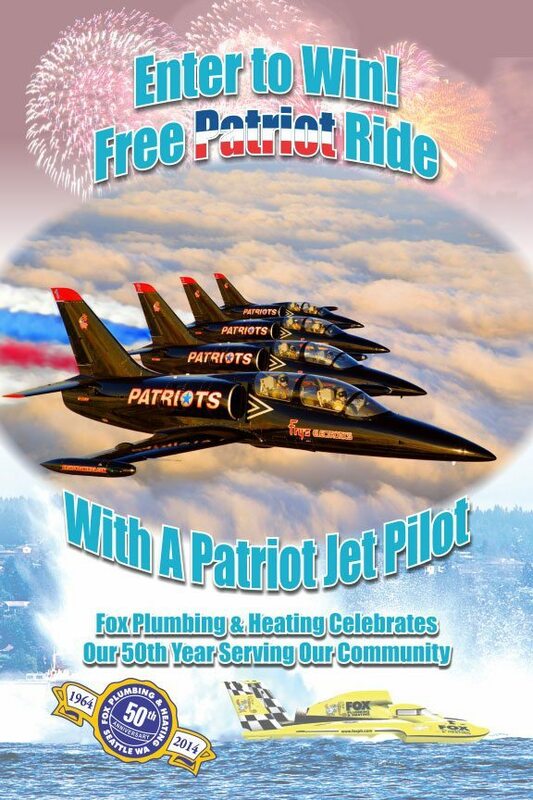 This year Fox Plumbing & Heating gave away a ride with a Patriot Jet to Gina Goolsby. She was the winner of our Social Media contest as part of our 50th Anniversary! See David Brown, Owner and President of Fox Plumbing & Heating select the winner of our Win a Ride With a Patriot Jet Pilot contest! 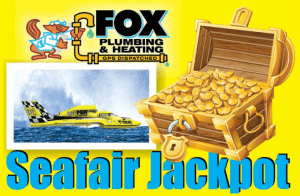 See Video of the Fox Plumbing & Heating Jackpot and the Winner, Oberto! Fox was also a partner with Seafair as the sponsor of their Street Team and having a booth at the 2014 festival. Fox sponsored an H1 Unlimited and a Tunnel boat during races. Fox also provided a Jackpot that was awarded to a Jimmy Shane and Oberto race team. This was the first in several years of such a large amount. Check out the news link! Fox Plumbing & Heating hires HuskyCreative of UW to Get the Word Out About Changes to Hot Water Heaters! GP-12 Miss Fox Plumbing & Heating Wins Two Races in Tri-Cities! U-9 Fox Plumbing & Heating Presents Red Dot - Take a Strong 3rd Place! U-9 Fox Plumbing & Heating Presents Red Dot First Tri-Cities July 2013! U100 Miss Fox Plumbing Seafair Hydroplane Press Release 2012!